Block wind and snow with an ice shanty. 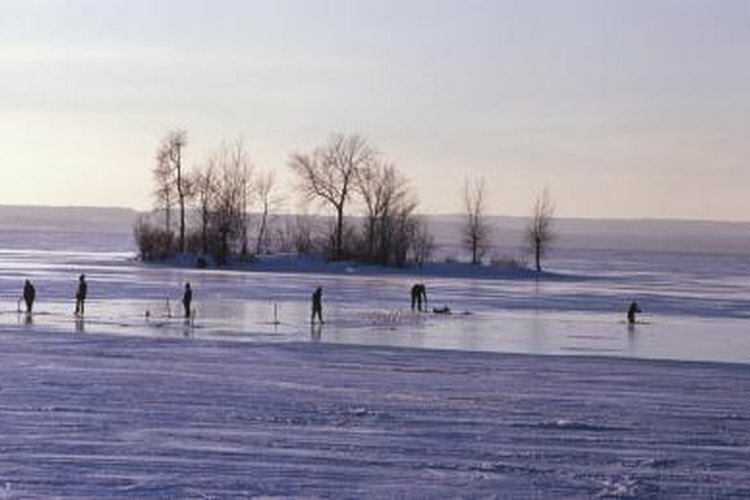 If you are a budget-minded ice angler, make your shanty out of a tarp and some inexpensive camping items. Plastic tarps block cold winds, and when set up properly, shed snow and ice buildup. Besides being cost-effective, these shelters pack up quickly and are stored with a minimal amount of space. Keep your tarp shanty kit in a stuff sack to prevent losing any of the pieces. Assemble the telescoping pole and set it aside. Spread out the tarp on the ground where you want the shanty. Place the pole under the tarp and push it up into the center of the tarp. Chip a hole in the ice where the bottom of the pole is positioned and then stick it in the hole. Pour hot water into the hole to melt the ice and then let it harden in the cold, securing the pole with a stronger hold. Stake out the tarp on the outside of the shanty using metal tent stakes and a mallet. Most tarps have grommets that make perfect spots to thread the stakes. Pull down and out on the tarp with each stake placed to add tension to the shanty, and extra hold on the pole. Cut a length of paracord approximately 2 feet. Use this to tie the two flaps on the tarp shut when you enter the teepee-shaped shanty. Alternately, use a ball-bungee to close the flaps. Position your chairs against the tarp walls on the inside to add extra tension to the shanty. If you are using a propane or flame-style heater in any shanty, tarp style or otherwise, be sure to vent the structure to prevent accidental asphyxiation.